Phobya's coolant series was specially designed for use in PC water cooling systems! Phoba's developer's years of experience in the water cooling sector have resulted in this mixture which features all the things one could ask for in a water cooling system: Corrosion protection, algae suppression, protection from disintegration of different metals as well as extremely low electrical conductivity. Of course plastics such as PVC, NBR, Acetal, Plexi etc. will not react with this concentrate. This water is the base for all concentrates. 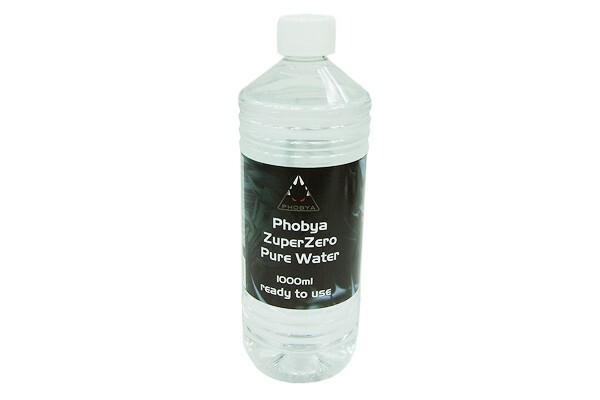 Even more pure than distilled water, purified and having all contents removed that so not belong into pure water: This is perfect for your water cooling system! Ich würde das Wasser gerne pur in die WaKü einfüllen. Oder ist ein zusätzlicher Korrosionsschutz doch besser? Ein Korrosionsschutz wird nur benötigt, wenn sie andere Metalle als Kupfer und Messing im Kreislauf verwenden.